With the moving away of the W.D., the day and night temperatures on wednesday/thursday have dropped to below normal levels in northern regions of Pakistan and India. Substantial drops of 2-6c have been noticed in many places, notably Amritsar at 11c (-5c) and Islamabad at 10c as the minimum on the 17th.. These variations , I had thought would not affect the sesonal low formations. But, as Vinson from Business Line rightly predicted, the seasonal low has become "distorted", and now is at around 1002 and that too the core having shifted east of its normal position. The required north/south trough has formed, and its initial position today is in the region of south Mah.leading southwards till south Karnatak. In the South China Sea, the 1st. typhoon of this season "neoguri" is now off the coast of Vietnam. Forecast models predict its movement towards the south China coast, and may strike land west of Hong Kong. But, at this time of the year, and season, when the monsoon winds have not yet formed in the Bay, and the W.D.s are still "sort of" active, it is not possible for an easterly "pulse " to form from this typhoon and creep into the Bay. Any low forming into the bay now has to be "in situ", that is to form on its own by heating of the waters in the Bay. With the Bay still at 29-30c, it seems the pre monsoon low is still at least 8-10 days away. In the southern hemisphere, the "power house" of the south-west monsoon, the mascrene highs, needs to form as an elongated high, at about 1025mb, from the coast of south Africa to a region west of Austrailia. This should be ready by the 1st. week of May to give a push the south-easterlies across the equator.Today there are 2 seperate highs in specific regions off the coast of south Africa, and west of Australia. But ECMRWF forecasts a fading away of the high off the Australia coast around the 24th. 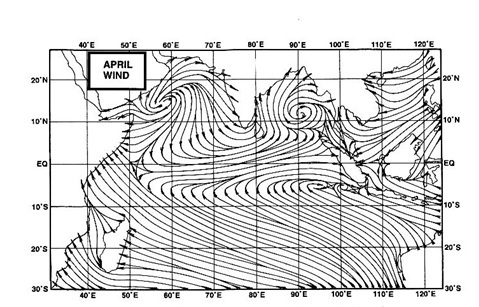 of April, due to the eastwards movement of an MJO. The result may be that the force of the south eastrelies heading towards the equator may diminish for a week. Also, the MJO may create a low off the coast of east Australia around the 24th. This may stagnate, for a week, the movement of the ICTZ. Seems a bit difficult with these developments for the monsoon to be earliar than the scheduled date.